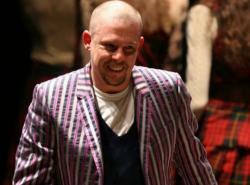 Innovative fashion designer Alexander McQueen, who died on February 11 2010, was above all a brilliant tailor. Arriving on the fashion scene via Central St Martin’s College after learning his craft in Savile Row he was grounded in how clothes are made and why they work. Though gay, his dresses celebrated and flattered the female form, rather than as with some more clichéd designers seeming intended for boys. He was unconventional too in his humour, seen in his famous ‘bumster’ jeans, some of the stranger catwalk moments he engineered, and if the legend is true in his unique addition to one of Prince Charles’s jackets. He had heroic style.